Trace Eye-D president, Chris Baden, recently sat down with the Bradenton Herald to share his insight on the company’s revolutionary trace detection systems and manufacturing tooling. The feature story focuses on Trace Eye-D’s product capabilities and ambitious targeted growth for 2018. The latest technology in preventing terrorists from setting off explosives and taking the lives of innocent civilians is being developed – and soon produced – in Manatee County. Trace Eye-D and it’s founders were the subject of a recent company profile by the Business Observer, a weekly newspaper for business leaders across Florida. The article offers an inside look to the inception of Trace Eye-D’s trace explosive detection technology to the company’s journey as a startup. SARASOTA, Fla. –Trace Eye-D, a South Florida security technology startup, has boots on the ground at the Defense and Security Equipment International conference and exhibition in London this week. Trace Eye-D business development partner, David Sykes, is in attendance for the five-day event, held annually from Sept. 11-15. Sykes will be on the ground browsing exhibition booths and sharing new developments about Trace Eye-D’s instant explosive threat detection products with his network of colleagues. 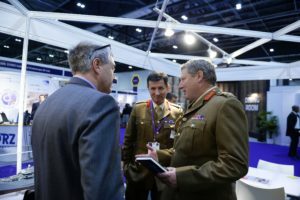 DSEI is the world leading event for the global defense and security sector, which brings together private sector companies, industry professionals, international military personnel and world leaders to share innovations and knowledge. Over 34,000 people are expected to attend DSEI 2017, which hosts five key sector-focused zones. This year’s zones include air, land, naval, security and joint, all showcasing the latest innovative equipment and systems. The event kicked off on Sept. 11 with a series of strategic conferences and keynote speakers, which are followed by a main exhibition and free seminar program from Sept. 12-15. Trace Eye-D is a research and development company headquartered in Bradenton, Florida with a research facility in Sarasota. The technology developed by Trace Eye-D is designed to equip military, law enforcement agencies and other security providers with solutions for counter-terrorism operations and threat interdiction. For media related inquiries, please contact our Tampa PR firm at 813.279.8335 or news@judgepr.com. TAMPA Fla. – Trace Eye-D, a technology research and development startup in Florida, filed a patent application revealing a new technology late last year, which is designed to detect and identify explosive compounds quickly and easily. 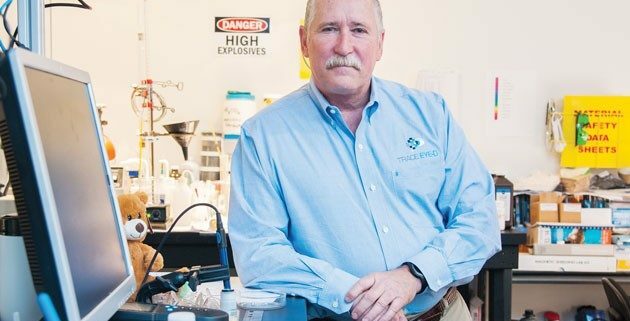 The new technology was developed over the course of two years at the company’s Sarasota, Florida facility and is capable of chemically detecting the presence or absence of an explosive substance on a surface within seconds. Leaders from Trace Eye-D believe the technology is a significant breakthrough in the fight against domestic terrorism because it gives law enforcement and security personnel the ability to rapidly screen areas or individuals for explosive materials, without the need for additional equipment. Researchers from Trace Eye-D believe the new detection technology is ideal for use by security screeners at airports, public transit hubs, entertainment and sports venues, and any public or private venue where there may be a threat. For more information on Trace Eye-D, visit www.trace-eye-d.com. To request more information about Trace Eye-D products or access to case studies, white papers and investor information, please complete the following online non-disclosure agreement.